Hooray! It is just about summertime! Almost everyone is out of school and it is time to go to the lake or the beach…wherever there is sand and water! 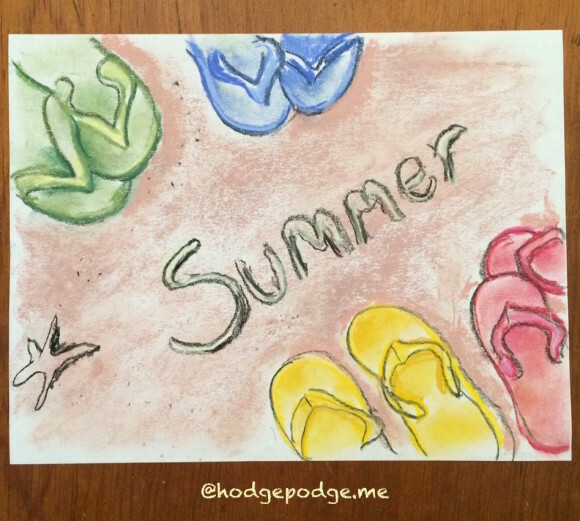 And the favorite shoes are an old favorite: Summer Flip Flops! 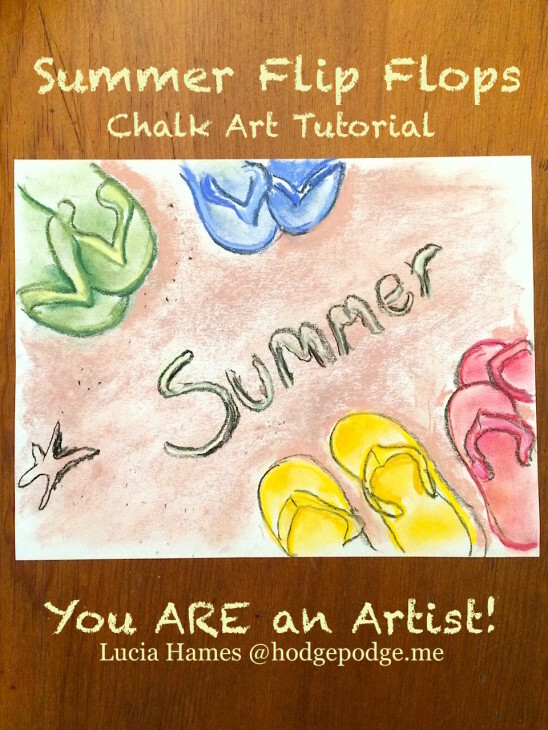 This pastel is very simple and fast for you to finish. The pastel colors are the following: medium green, black, medium and light blue, medium yellow and light yellow, cherry red and pink. The sand color is a mixture of light brown and a medium pink. Turn your paper horizontally. 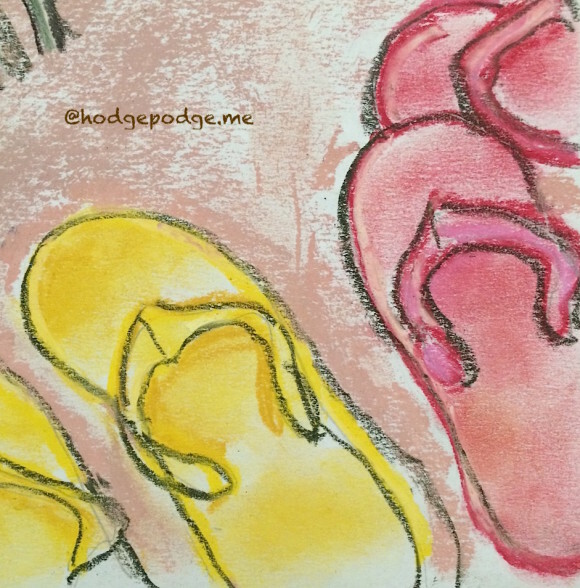 If you would feel better sketching your flip-flops lightly with a pencil, go ahead, the pastel will usually cover the marks if you sketch with a light hand. Go ahead and write the word “Summer” diagonally across the middle of the paper. I started with the green flip-flops at the top left on the paper. You only need a part of the flip-flop, just the part your toes would fit into. The strap is just a floppy “V” shape. In coloring your flips I suggest this: put your pastel color on as an OUTLINE of the shoe and then, using the tip of your finger gently smooth the color into the shoe shape. It is almost impossible to get full color coverage in such a tight area, so use your best tool: your finger! 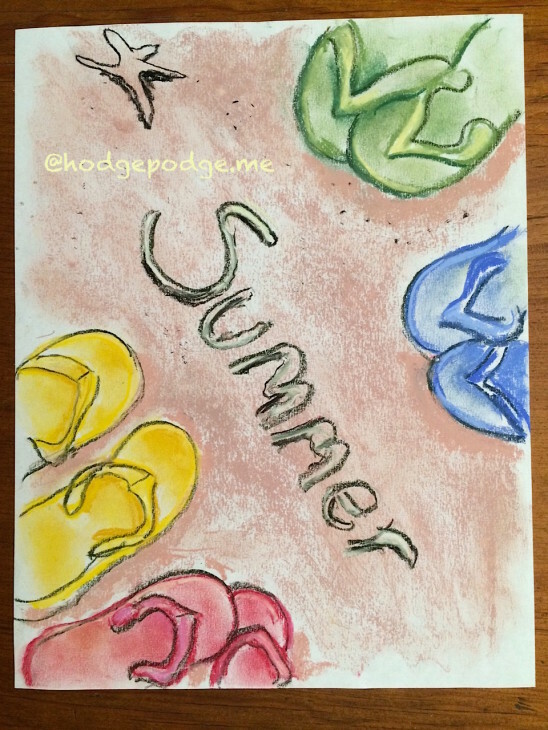 I outlined each of the flip-flops with a black pastel. This defines them and the viewer can see them better. Each of the other flip-flops are done in the same way as the green ones. Be as careful as you can when you smooth the colors, then outline them in black. Then the sand is colored in…you can turn the light brown pastel on its side and get better coverage and a light color. You may want to use a slightly darker shade of brown if you want to add a shadow on the outside of the flip-flops. 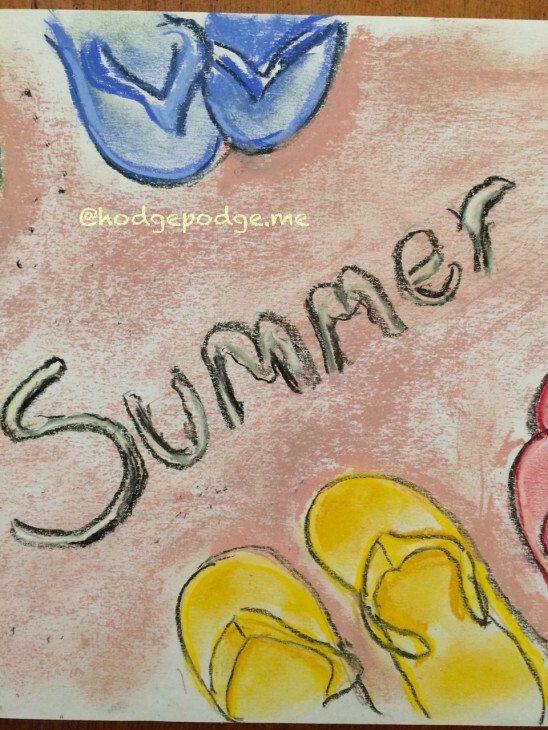 The word “Summer” is outlined with the black pastel on both sides of the letters. This is an attempt to make the viewer think that the word was drawn in the sand! Now add a starfish or shells…and a FEW black specks of sand…and you are finished! Oh my! You have done a wonderful job on this painting! Your colors are great! Be sure to sign your name in the corner and flip the painting over and name it and date it. Make sure to put it up somewhere that you may see that it announces SUMMER! And always remember, you ARE an artist!